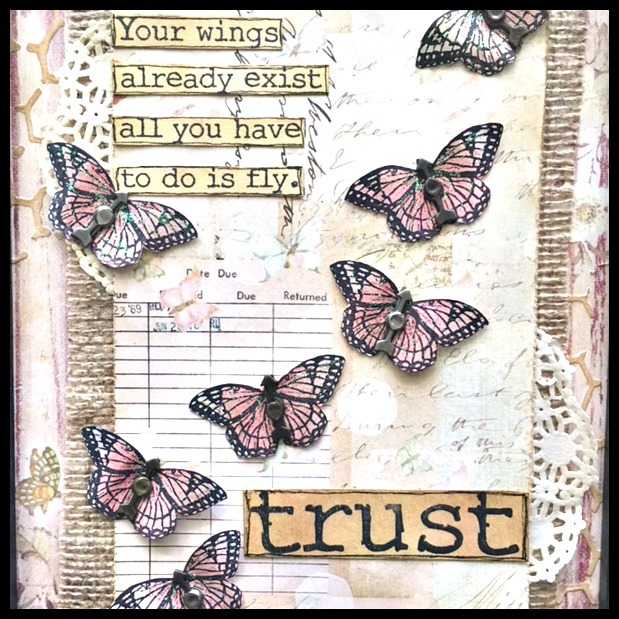 Susan's theme of "Winged Things" which has made my heart sing again. being very creative. All this negative energy is horrible. As I sat thinking about the theme, I realized that I don't want to let the bad going on in the world dictate what I am doing and what message I am spreading. I thought, positive messages, positive thoughts, being positive is my power, our power. So, what is one of the messages I want to put in the world? Have faith and Trust...your journey is different from everyone else's. It's your journey...TRUST...trust that what is meant for you will be a part of your journey. there are always treasures to be found. I wanted piece to be layered and have some natural elements to it. I used Burlap for that...it adds such yummy texture and dimension. Worn Lipstick and Gathered Twigs Distress Ink then fussy cut them all out. The wordy stamps are mine from Impression Obsession and I don't know who makes the butterfly..
there is no marking on it and it is an old favorite. 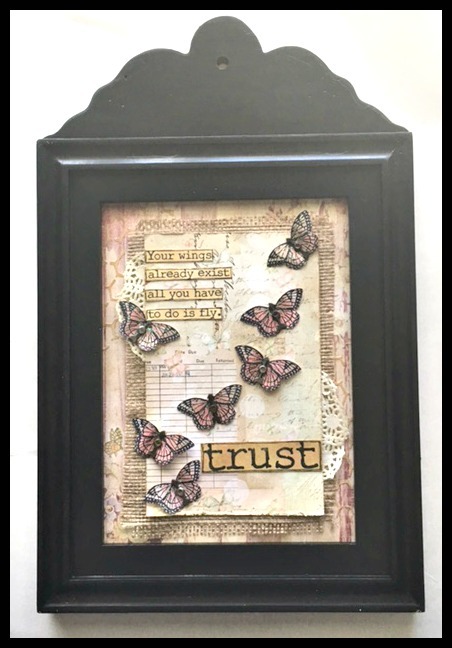 Love that I can attach some ribbon to the top of the frame and hang it. I haven't found the perfect home yet, but I am sure I will. This is something that I want (and NEED) to see everyday! Thanks for stopping by and visiting the ole blog today...I hope you enjoyed it. 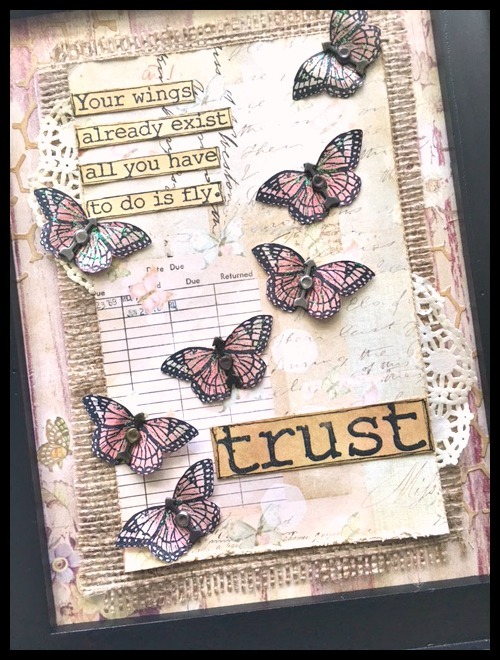 I hope it inspired you to find your creative wings and play along! Thanks Susan for this fun theme! we also have a Facebook group you can join in and start sharing with us! Oh, Yvonne. You've just made my day so much better! I'm looking for the light in these days, too, and you've just made it brighter. The art is beautiful here. I'm just studying and enjoying those layers! I'm headed down to my studio now, encouraged, inspired, having found a bit of joy. Thanks, love.